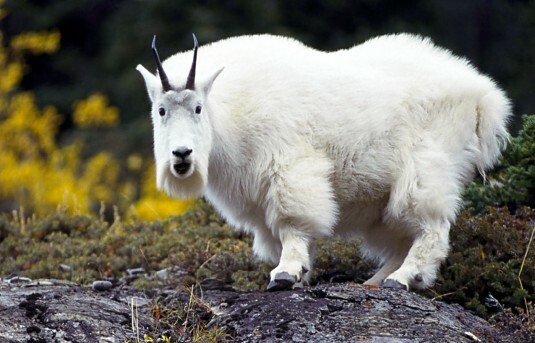 Both male and female mountain goats have beards, short tails, and long black horns which contain yearly growth rings. They are protected from the elements by their woolly white double coats. The fine, dense wool of their undercoats is covered by an outer layer of longer, hollow hairs. Mountain goats molt in spring by rubbing against rocks and trees. Their coats help them to withstand winter temperatures as low as -50 F (-46 C) and winds of up to 100 mph (160 km/h). A male (Billy) stands about 1m (3.3 ft) at the shoulder to the waist and can weigh considerably more than the female (nanny) (around 30% more in some cases). Male goats also have longer horns and longer beards than females. Mountain goats can weigh between 45 and 140 kg (99 and 309 lb), though even males will often weigh less than 82 kg (181 lb). The head-and-body length can range from 120–179 cm (47–70 in), with a small tail adding 10–20 cm (3.9–7.9 in). The mountain goat's feet are well-suited for climbing steep, rocky slopes with pitches exceeding 60°, with inner pads that provide traction and cloven hooves that can spread apart. The tips of their feet have sharp dew claws that keep them from slipping. Mountain Goats inhabit the Rocky Mountains and Cascade Range and other mountain regions of the Western North America, from Washington,Idaho and Montana through British Columbia and Alberta, into the southern Yukon and southeastern Alaska. Its northernmost range is said to be along the northern fringe of the Chugach Mountains in southcentral Alaska. Introduced populations can also be found in such areas as Idaho, Wyoming, Utah, Nevada, Oregon, Colorado, Texas, South Dakota, and the Olympic Peninsula of Washington. Mountain goats are the largest mammals found in their high-altitude habitats, which can exceed elevations of 13,000 feet (4,000 m). They usually stay above the tree line throughout the year but they will migrate seasonally to higher or lower elevations within that range. Winter migrations to low-elevation mineral licksoften take them several kilometers through forested areas. Mountain goats are herbivores and spend most of their time grazing. Their diets include grasses, herbs, sedges, ferns, mosses, lichens, and twigs and leaves from the low-growing shrubs and conifers of their high-altitude habitat. In captivity, the mountain goat's diet can also include grain, alfalfa, fruits, and vegetables, and grass. In the wild, mountain goats usually live 12 to 15 years, with their lifespans limited by the wearing down of their teeth. Despite their common name, they are not a member of the genus Capra like all domestic goats. The Mountain Goat is of the orderArtiodactylaand the familyBovidaewhich also includes antelopes,gazelles, andcattle. They belong to the subfamily Caprinae (goat-antelopes), along with 32 other species including true goats, sheep, the chamois, and the muskox. The mountain goat is the only species in the genus Oreamnos. The name Oreamnosis derived from the Greek term oro "mountain" and the wordamnos "lamb".